Lets take a look at what I received in my November 2018 ‘Goal Digger’ Boxy Charm. 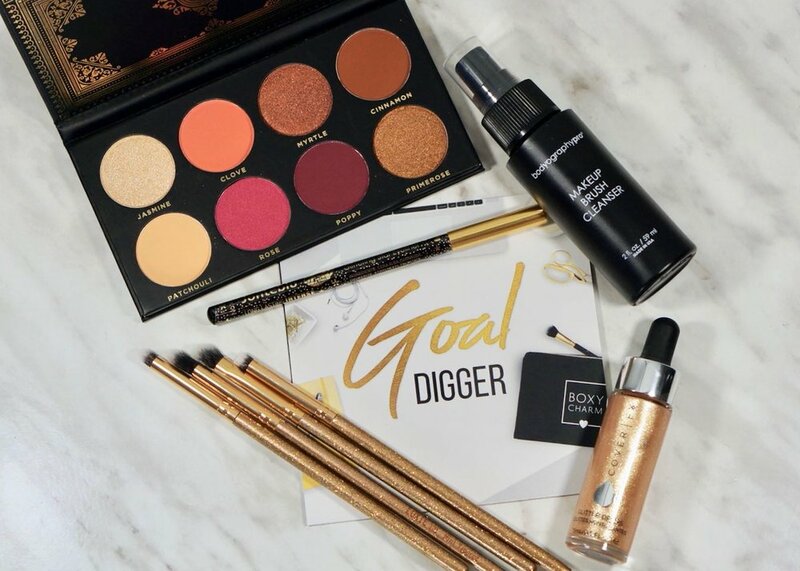 The theme for the November Boxy Charm was ‘Goal Digger’ and it would appear also black and gold! All the products I received are either black or gold or a mixture! The #BOXYFACT for November: All of our Boxy Babes this month are our very own employees. Since the theme on the month is Goal Digger we wanted to highlight just a few of the goal diggers we see every day! Another heavy on the makeup box! In the November ‘Goal Digger’ Boxy Charm I received quite a bit of makeup to add to the ever growing collection…. I received an eyeshadow palette, glitter drops, eyeliner, brushes (always happy to get!) and a brush cleanser. CoverFx Glitter Drops - Nova - These ultra-concentrated drops of multi-dimensional glitter create a high impact, reflective finish that wows. This multi-use glitter can be used alone, under to over makeup, or mixed into your foundation or moisturizer for an incredibly luxe, glitter effect on the face or body. Retail $44.00 USD. I am not usually someone who is in love with glitter that much! I am not sure how I will use these, I seriously doubt I will put them on my face!, but I may try them mixed in with hair products? Or maybe on the eyes? ill have to look up some different uses for them. I will let you know if I do end up trying them out. Ace Beaute - Grandiose Palette - Featuring 4 shimmer shades and 4 bold mattes, your Grandiose Palette has all you need to create unlimited eye looks. These eyeshadows were carefully milled and pressed to deliver intense pigmentation and easy blending. Retail $24.99 USD. A very warm-toned palette! I will say that the shadows in this palette are very soft and pigmented, hopefully that is true on eye application! 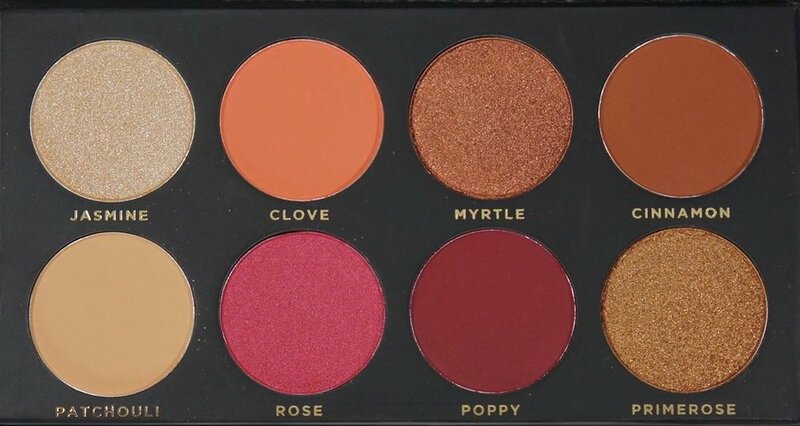 The shades included in the Ace Beaute-Grandiose Palette are-Jasmine (champagne shimmer), Clove (matte peach), Myrtle (shimmer bronze), Cinnamon (matte warm brown), Patchouli (matte cream), Rose (shimmer pink), Poppy (matte burgundy), and Primrose (shimmer gold). Luxie - Luminous Eye Set - Add a little sparkle to your brush collection with this limited edition Boxycharm collaboration. The Luxie Luminous Eye Set features 4 synthetic eye brushes exclusively wrapped for Boxycharm. The LUXIE 141 Mini Round brush is perfect for smudging or smoking out your lower lash line, while the LUXIE 121 Mini Tapered lets you effortlessly blend your crease colour. The LUXIE 111 Mini Flat Angled brush lets you blend out harsh lined or pack on cream products to your lid, and the LUXIE 131 Mini Angled can add a pop of colour to your brow bone or precisely place colour onto your crease. Retail $21.00 USD. One of my favourite things to get in these boxes, Brushes! I am always happy to see brushes in my Boxy Charm. I can never seem to get enough of brushes, always on the hunt for a favourite brush. The brush heads on all these brushes are fairly small though, more for detail work, which I am not really doing right now. These brushes are stiffer and like I said earlier smaller than I usually use but I am sure I will be able to find a use for them. Jonteblu - Glittering Star Eyeliner - Sparkle up your glam withJonteblu Glittering Star Eyeliner. 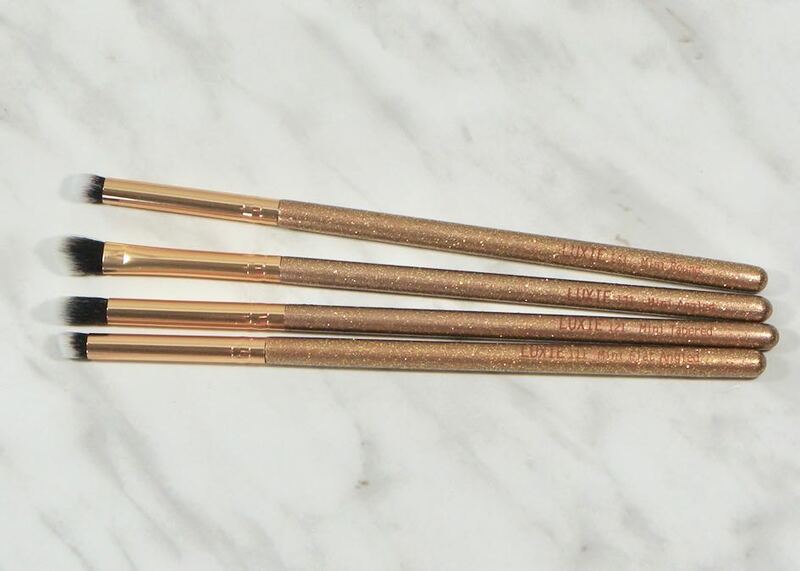 This specially formulated black glitter eyeliner pencil glides on smoothly, leaving behind a long-lasting and subtle shimmer you’ll completely adore. Retail $5.00 USD. A glitter black eyeliner…2 things I am really not into. I didn’t even open this to swatch as I know that I will not use it. I much prefer brown liner and no glitter! Into a giveaway it will go. Bodyography - Makeup Brush Cleaner - Cleansing and disinfecting your brushes has never been easier. Made from natural orange peel and gentle cleansers, this cleansing spray easily disinfects and conditions your brushes. Retail $12.00 USD. Not the most exciting thing to receive, but it is a needed item, especially with all the brushes we get. I usually use Cinema Secrets or a colour switch for spot cleaning and Sephora brand solid cleanser, or Purity, to deep clean my brushes. It will be nice to try something different and see if it does as good a job as any of those options. Violet Voss - Liquid Lipstick - Hush Hush - This liquid lipstick formula offers high pigmentation and radiance that does not budge. The long-lasting liquid lipstick applies smoothly and dries quickly to deliver the perfect matte finish. Retail $12.00 USD. I can’t seem to find much of anything out about this liquid lipstick! I believe it was the replacement item from Boxy Charm for having been sent the Wander Beauty Eye masks a second time last month! Above is all I could find about the lipstick, from the Boxy Charm website. I’m not that into shimmer on my lips but this could look nice for the holiday season. My November ‘Goal Digger’ Boxy Charm box had a retail value of $106.99 USD not including the Violet Voss, on the lower end, but still way more than the $35.ooish CAD that I pay for it. I still think that I get my moneys worth out of the subscription box though, I get to have a surprise and try out new things each month. From the November box I think that I will get use out of 3 of the products for sure and I will experiment with one other. I have to say that I didnt get around to trying out most of the products from the October ‘Alter Ego’ box as of yet. I did try the PUR palette and it just really isn’t for me. There are no transition shades in there for me nor a matte brow bone. The shimmer shades are nice though, if you are looking for that type of palette. All of the blush shades have shimmer in them, which I don’t mind that much but I do prefer matte blushes more. I didn’t try anything else from the box last month, sorry about that. But I really haven’t been wearing makeup much throughout December, and I won’t be able to wear any for most if not all of January after surgery. Eye surgery is done and my eyes are finally not as goopy as they have been since surgery. I do still need to get new glasses but the worst is over. I will try to get caught up quickly so that I can get back to regular posting. I think I will continue with separate posts for Boxy Charm but I will put Trip Through My Trash and New In together. I signed up to get the December 2018 Boxy Luxe, so the next post will be all about that!